TWDD meditation originated in Tibetan Buddhist Meditation / Yoga practice. After a process of reforms, a series of public teachings has been developed by Master Hai Kong and has made available to the general public for the first time in history. During his ten years of solitary meditation retreat, Master Hai Kong realized that modern people have great difficulty letting go of attachments in their lives. For many, it is almost impossible to settle their minds into the peaceful state that is mandatory for meditation practice. This makes it very difficult to work towards improving quality of life. Following his ten years of research and deep meditation, Master Hai Kong created Talismanic Wheel and Diamond Dharma. This incorporates the essence of three very powerful ancient meditation/Yoga techniques. When these are practiced for 2 hours/per day in up to 7 days, the practitioner will be able to not only reach the peaceful state of mind in just matter of minutes but also establish connections to his/her Dharma nature – a very high level of meditation stage. In the traditional way of Tantric meditation teaching, this process will take approximately 6 years! Why do we need to connect to our Dharma nature, and how will this help us to improve the quality of our lives? When asked this question, Master Hai Kong answered with an analogy: Imagine you want to clear up a dusty and dark room that has been there for many years, what would you start off with? The first thing you have to do is to open up the door, so you can walk into the room. Then, in order for you to identify how dirty/dusty this room is, what kind of tools you need and what kind of immediate action you can take, the next thing you will need to do is to open up the windows and blinds to let the air and sunshine come in. Likewise, establishing connections to the Dharma nature allows you to break through self-centered habits, open up the door to your own nature of mind and allows your inner wisdom lead you to true happiness. By doing this, you create a blue-print that can be used as a guidance for your future meditation practice and physical/emotional well-being. How does TWDD differ from other types of meditation? In the Buddhist world, it is said that there are 84 000 different ways to attain enlightenment. All ways point to the same destination, and every way could be a good way depending on one’s natural affinities. TWDD is one of those 84 000 Dharma teachings and has been specifically created to fit contemporary lifestyles. We are living in the Information Age. Our lives are fast-paced, filled with material lust, commercial competition, unrealistic desire and high expectations. In this environment, TWDD represents a powerful tool to unfold our inner peace and to develop true happiness. What do we need to do after we have connected to our Dharma nature? Follow your blue-print, meditate consistently and let your wisdom grow. The goal of meditation is to develop the wisdom that allows you to unfold your inner strength and understand the truth, meaning, and purpose of human life. Practicing meditation is just like learning to play the piano. Firstly, you need to learn from an experienced and skillful teacher and make sure that you have grasped the essence of his or her teaching before moving on to the next level. Secondly, the progress should be measurable and evident. It might take months, years or a lifetime for one to go through the different stages of meditation practice, but the accomplishment at every stage should have noticeable impact on one’s life. Also, with guidance from the Guru, consistent practice SHOULD and WILL give one the wisdom to know where one is at within the entire process. Meditation should not be treated as just a habit, an interest, a philosophy or even a funky trend. It is a tool for us to create our living well-being and to enhance the quality of our existence. TWDD has traveled thousands of miles from ancient China to the beautiful land of North America. As a Chinese-Canadian, I am very proud to be the one to share this wonderful gift with all Canadians and possibly Americans in the near future. 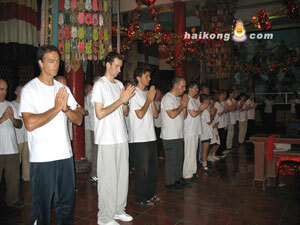 TWDD has changed the lives of millions of people since Master Hai kong’s first teaching in 1994. I am confident that these teachings will continue to help many more to experience the great compassion that the universe has created for us and to find true happiness. Our goal in 2006 is to spread this great meditation method to as many people in Canada and in the English-speaking world as we can. To help English-speaking people with their future practice, and to provide them with the guidance to reach difference meditation stages and levels, we are also going to translate TWDD books and teachings published at the Chinese TWDD School into English. Our dream is to build our own practice center where we can provide not only TWDD teaching and training, but also a retreat centre to bring a powerful healing tool to people who are suffering from physical and psychological pain. We hope to realize this dream within ten years.